The signs are undeniable that some sort of historic event is imminent. The latest economic news makes it certain that the Western financial system as we know it is about to end. The question is, will there be a controlled implosion followed by a phoenix like revival or, will there be revolution, chaos, anarchy, bloodshed and misery. The answer now lies in the hands of the military forces of the West because the political world, especially in the United States, is dysfunctional. To understand how serious the situation is, please look at the following chart. It shows there is about $80 trillion worth of financial products in the United States that has no basis in the real world. 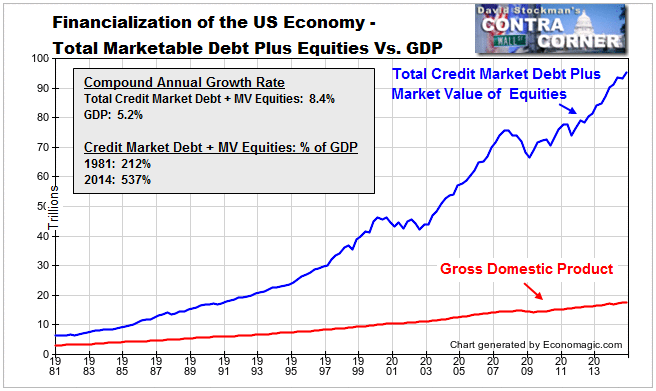 During the Japanese bubble I used a similar chart to show the bad debt in the banking system was worth 200 trillion yen at a time when the Japanese government was saying there was only 3 trillion yen worth of bad debt. Another way of putting it is that US asset prices will have to fall by about 80% before they hit the ground of reality. Japanese real estate prices fell 90% after the bubble burst there. The American bubble is 49 times larger than the Japanese bubble was. It is not a question of if it will burst but when. Denying reality does not make it go away. There is also evidence coming from indexes based in real world transactions that cannot be manipulated by financial trickery. One is the Baltic Dry Index, the price of shipping goods, mostly raw materials like oil, metals, grains etc. It is at a record low now. Another is the China Containerized Freight index, which measures the cost of shipping finished industrial goods out of China. It is also at a record low. Perhaps you have noticed your e-mail spam filter is now featuring more Chinese enterprises desperately seeking customers than Viagra ads or Nigerian scams. Clearly something big is about to happen in the worlds’ markets. There are a lot of people figuring this out now. The American Association of Individual Investors survey shows that in May of this year individual investors dropped the percentage of money they invest in shares to 57.8% from 67.9%. This is an astounding dumping of over 10% of their shares in exchange for cash in just one month. The Greeks are also bailing out of the Greek banking system at a rate of over 500 million Euros per day. This sort of thing is usually referred to as a bank run or as rats deserting a sinking ship.